I just had a band family bring Music Go Round to my attention and they had a very positive experience. They have stores on Bethel Rd. and Morse Rd. 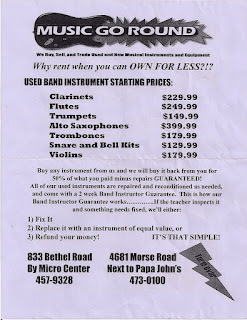 in Columbus and they deal exclusively in used instruments, and have a very generous guarantee and exchange/return policy. Check out the attached flyer (which includes addresses and phone numbers) for more information. 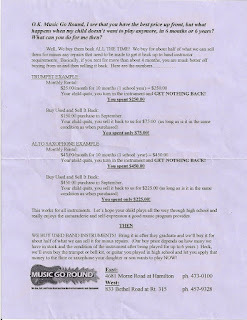 If your financial situation is such that new instruments are out of your reach, this could be a viable option. You can also fine out more about the company at their website.